Now, talk about a nice big slab of reverse plastic or what?! The entire front panel on this classy horizontal coat-pocket set is reverse painted in beige, gold, and black. And yes, that is Nipper in the lower left corner, painted in gold and complete with the famed "HIS MASTER'S VOICE" lettering below. The cabinet is made of a thick hard plastic and so far I have only seen the P-331 in this light blue colour. While I don't have specific data on a product release date for the P-331, this radio's twin in the domestic Japanese market went on sale about August 1957 and the unit above was built in early '58. 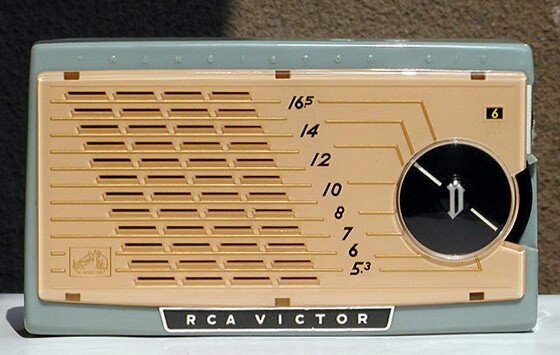 Made for RCA Victor Canada, Ltd. and sold exclusively in Canada, the P-331 happens to be an OEM version of the Victor TS-600, the first transistor radio built by Nippon Victor in Japan. To date I have only been able to confirm about a half dozen existing samples of the P-331 in the hands of collectors, including a couple that are badly broken up.